﻿ Slavetrade between Africa and the Caribbean from start to end. Slavetrade between Africa and the Caribbean from start to end. The English involvement in the slavetrade. Who were the traders, how did the slavetrade start and when was the slavedtrade abolished? Facts about slavery. Guides » Slavetrade from Africa to the Caribbean. Slavetrade from Africa to the Caribbean. Slavery and colonialism on the Caribbean islands. Prologue to the trade of slaves from Africa to the Americas. The first man of African origin who went to America at 1492 was a member of Columbus crew. He was a free man from Spain. In 1494, at the second Columbus mission to America, at least two other black men were landing at the island Espaniol. 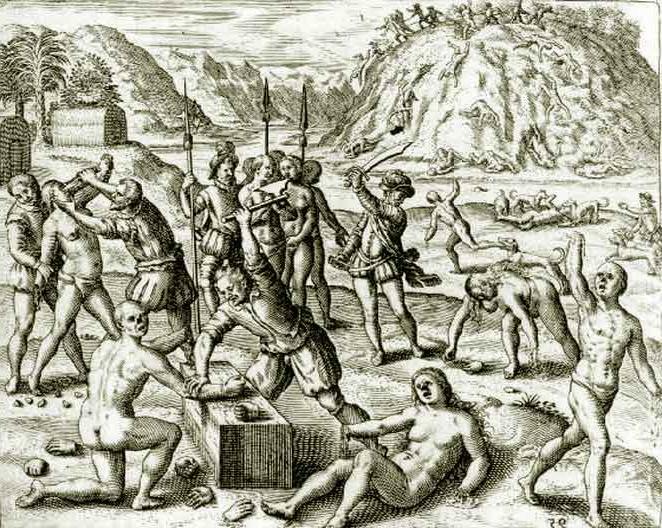 Arawaks fighting the Spanish invaders. When the Spanish started to colonize Caribbean islands they obliged the native population to do all the labor that Spanish disdained to do. 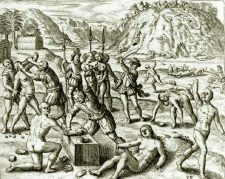 The amerindian Arawaks and Caribs were not ideal for their purposes. Soon most of the original Indian population died from the illnesses and the bad treatment. Subsequently the colonists looked in Africa for new labour force. The colonists found it was easier and cheaper to import the Africans as slaves instead of using the Amerindians. Slavery was familiar to Spanish, because they used African, and Jews as slaves. The Spanish law alowed slavery, while at the same time they declared that slavery is “the most detestable thing”. From the island Hispaniola slavery of African people spreaded to Cuba, Puerto Rico, Jamaica, Mexico and Peru. From there the slaves were sold and transported to the rest of South America. Beginning of trade in slaves. 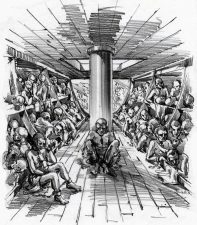 Slaves packed underdeck in a Dutch ship. In 1619 a Dutch merchant imported African people tot the Americas. In chains they were forced to work at Jamestown of Virginia. The Dutch inaugurated with that way the slavery in English colonies of north America. As businessmen quickly adapt each other business model, others soon followed in the Trade of slaves. Merchants from Boston at 1644 chartered the first ship with the name “Rainbow” to transport systematically Africans to North America. 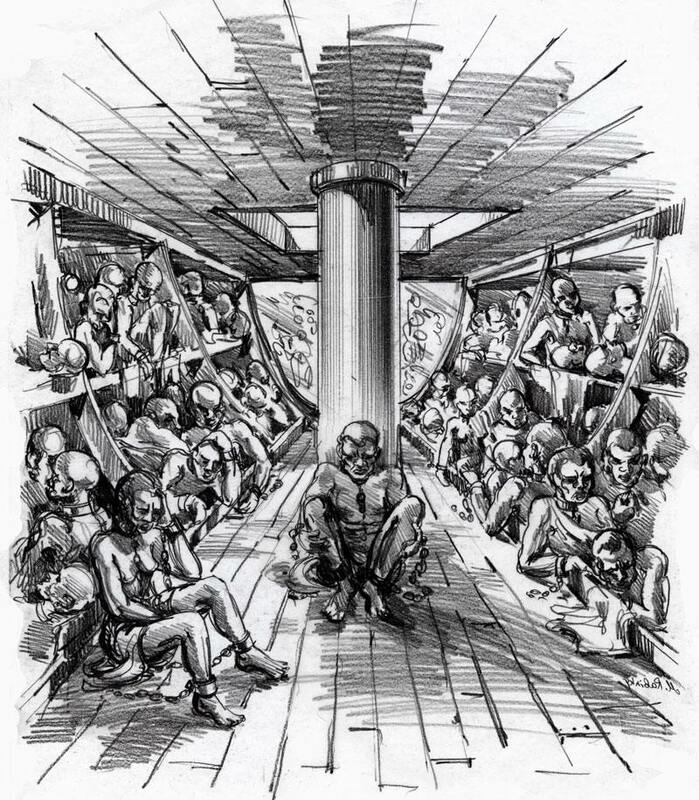 Interior of a slave ship. The period between 1740 and 1810 constituted the prosperity of slavetrade because the number of slaves who transported each year in America approached the 60.000. Objective of trade in humans and lack of compassion. The only aim of slave-trade was to make money for the ship owners. Having bought slaves very cheaply in Africa, they sold them again in the Americas as a large profit to slave owners. Subsequently the new slave owners would use them to do all the hard labor on farms and cotton plantations. 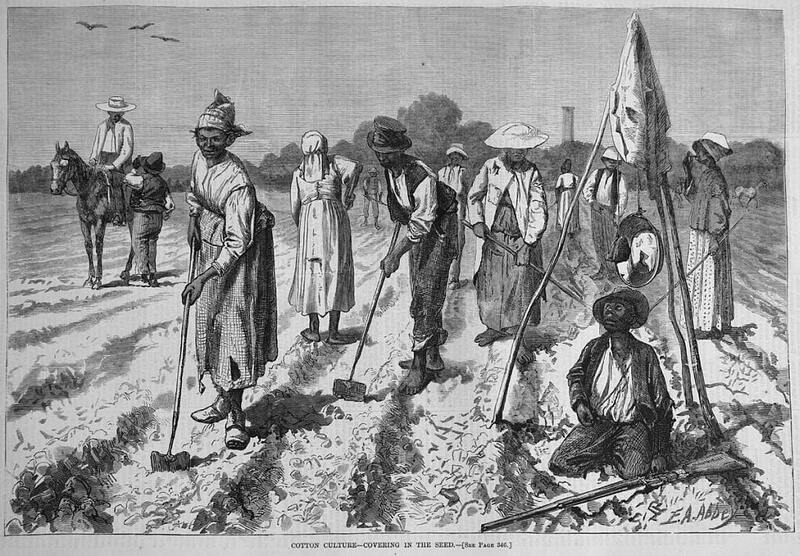 Slaves working on a cotton field. Since making money was the only objective, no consideration was given to the Africans as human beings. Many slave owners treated slaves just like common animals, often whipping them and even tying them up. 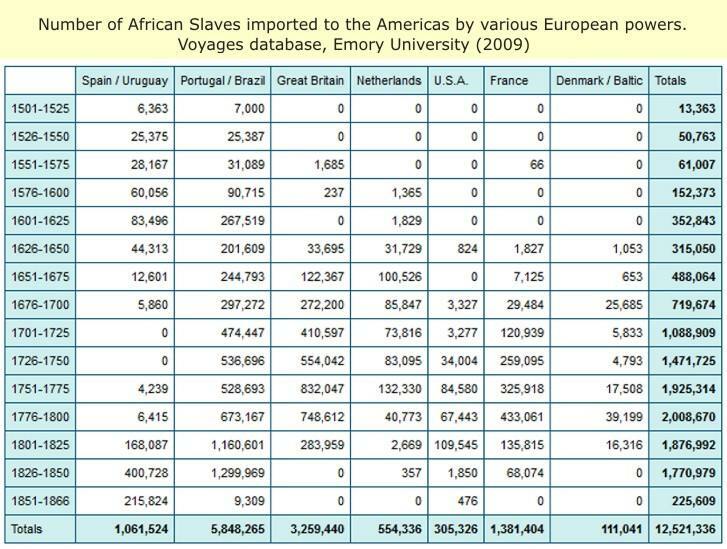 Amount of slaves trasported from Africa to the Americas. The exact number of all African people transported to America cannot be calculated. This number approached the 10 or 12 million. Lots of them died in African coasts waiting for the ships to go. Other slaves drowned during the trip to America. Amount of slaves in the British Caribbean. An estimate of the population of slaves in the British Caribbean during the period of 1776 to 1848 is approximately 428,000 out of a population of 500,000. England’s involvement in the slave trade can be seen to this very day in the National Gallery. During the 17th and 18th centuries, involvement in the slave trade was actually seen to be a respectable occupation! Many of the merchants who imported sugar from the West Indies lived in South London in Blackheath. From the survivors of slave transport 95% went to Latin America. Brazil received the most of African people, about 5 million. Spanish colonies received 2 million slaves. The rest of them went to English, France, Dutch and Danish colonies in Caribbean. 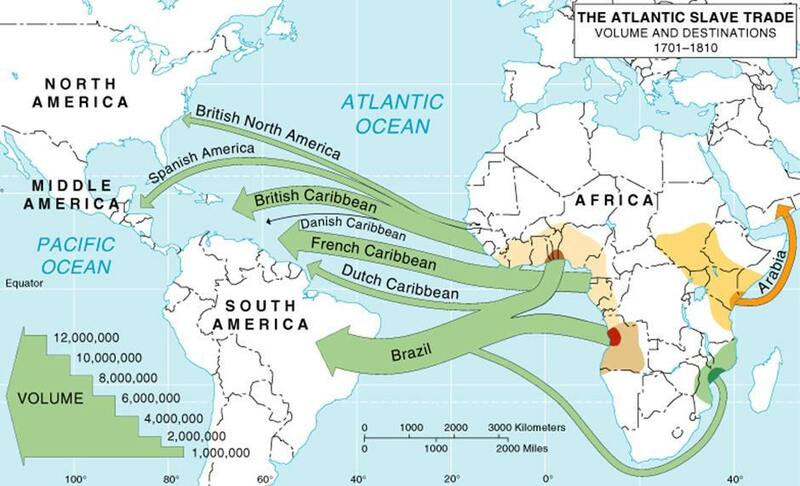 The trade of slaves between Africa and the Caribbean from start to end. Who were the traders, how did the slavetrade start and when was the slavetrade abolished? Some startling facts about slavery. The English Involvement in the slavetrade. 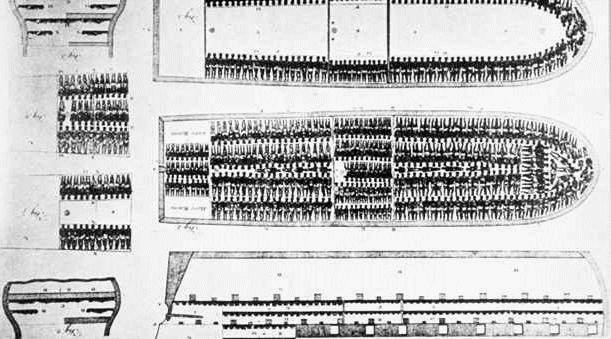 British slave ship around 1600. Most people are aware of the part America had to play in the business of buying and selling black people into forced labour. The United Kingdom also had their part in this twisted scheme that yielded an enormous amount of money for certain people in the aristocracy and otherwise. Way back in the day England was well known for it’s ships and the advantages this gave them in terms of defending their seas and also transportation. Power of England through slaves and sugar. advantage were sugar and slaves. 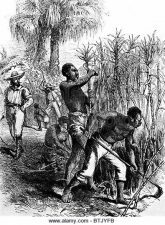 The two factors actually worked together very closely as slaves were needed to harvest the sugar crops in what the British Empire called the ‘New World’. Ships would leave Britain with cargo of cheap manufactured goods from Liverpool and Bristol and travel to West Africa. Once the ships arrived in Africa the goods would be exchanged for slaves. 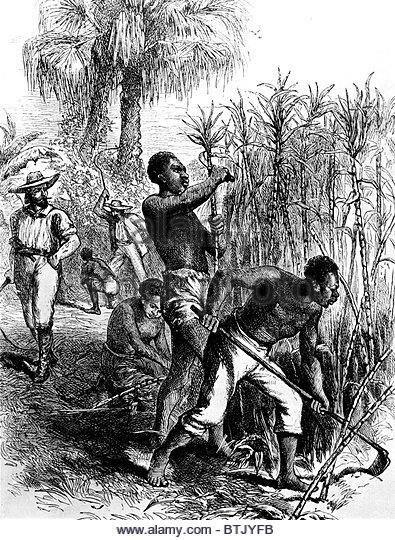 The slaves were then taken to the Caribbean where they were exchanged for sugar. This sugar was then brought back to Europe and sold for a very large profit. The huge monetary gain made sure people were not overly concerned with the humanitarian aspect of the slave trade or even the ethical issues. Britain the advantage of being the world’s most forceful naval power. 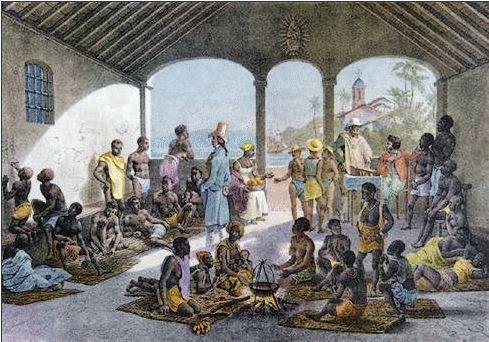 1562 – The first English slave trader sells 300 slaves from Sierra Leone to Hispaniola. John Hawkins – Slave trader. The first English slave trader, John Hawkins, left England In 1562 with 100 men and 3 ships. He captured 300 slaves in Sierra Leone and sold them in Hispaniola. He was a resident of Deptford, South-East London. After his return he had his ships filled with goods such as hides, ginger and sugar. John Hawkings then found a new business partner in Queen Elizabeth I. By 1567, Hawkins was onto his 3rd slave trading expedition, together with Sir Francis Drake. Francis Drake was yet another pioneer of the slavetrade and also a Deptford resident. 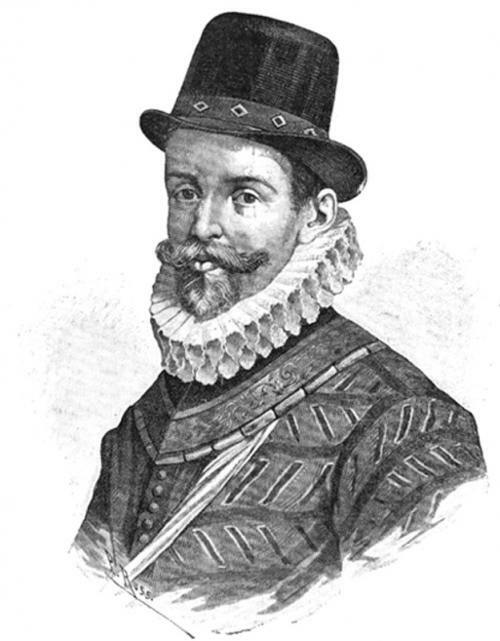 His family were well connected with slave trading as was Sir Walter Raleigh. 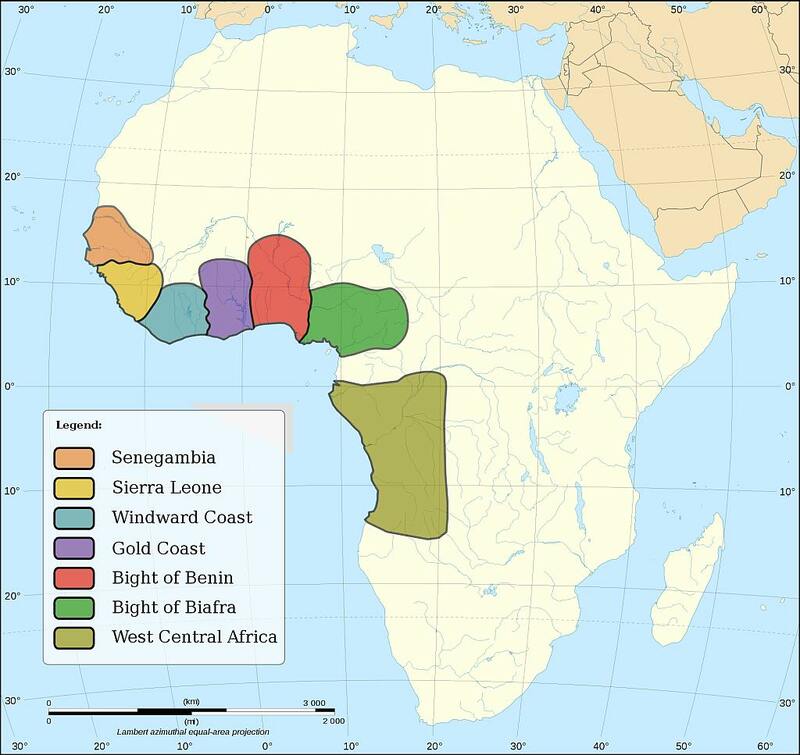 African east coast with slave markets. Some of the races and countries of slaves who went to America. 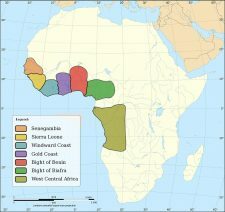 “Bolof“, “Mandinka“, “Barbara” from Gambia, “Akin” and “Fetu” from Sierra Leone and Gold Coast, “Fo“, “Ebo” and “Yuroba” from Togo, Nigeria and Cameroon, “Voudou“, “Bango” from Congo and Angola. In time, slave traders developed preferences about the origin of slaves. “Akin” from Gold Coast was a very agitator race. “Ebo” from Nigeria was very teachable and slaves from Angola was very warlike. 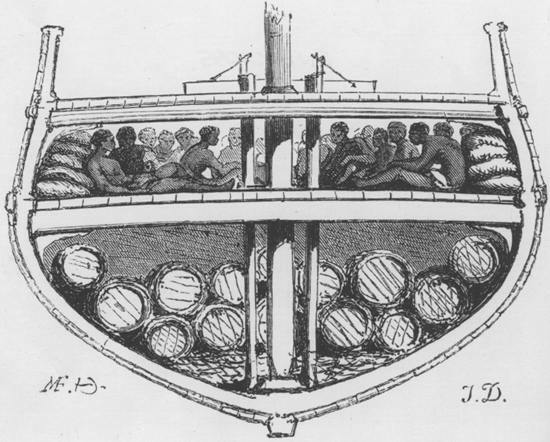 Ship transport of Africans to the Caribbean. The English Royal family had a great connection with slavery starting from Elizabeth I. The Duke of York used to get his initials, ‘DY’, branded onto the left buttock or breast of each of the 3000 slaves who were his. He then shipped them out to the Caribbean. Colonization by the British of Barbados – Saint Kitts and Jamaica. In 1624 the English colonised Barbados and St. Kitts. Approximately 23 years later the first sugar from Barbados was sent to England. England subsequently captured Jamaica from the Spanish and the slave trade had yet another place in which to thrive. Slavetrade controlled by the British Royal African Company. Now the British decided to create a company that would control the British slave trade. This company was called the Royal African Company and was established in 1672. Company share of the British Royal African Company for slavetrade. Slavetrade by the R.A.C. between the years of 1680 and 1686. The Royal African Company transported an average of 5,000 slaves per year. The Royal Afgrican Company received annual grants from parliament. These grants totalled around £90,000 overall. Even King Charles II was a shareholder, maintaining the Royal involvement with slavery. Private slave traders were allowed from 1698 onwards. Slaves packed on a ship. Soon enough private slave traders wanted in on the lucrative trading of ‘human cattle’. In 1698 parliament approved private traders to participate in the slave trade. 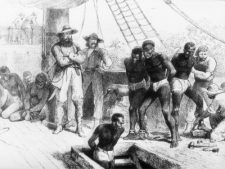 These slave traders had to pay 10% duty on English goods exported to Africa. At this time the Royal African Company was abolished . Conditions on a slave ship. The transportation of slaves to America was tragical. 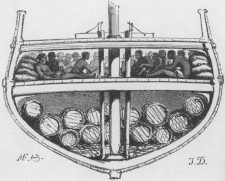 The ships were dramatically full and the slave ship captains were making less space for a slave in the ship then a man in the coffin. though they might lose up to 25% of the lot on the way across the ocean. than Christian and that it is a heinous crime to buy them. How much was a slave worth? Slave market in the Caribbean. 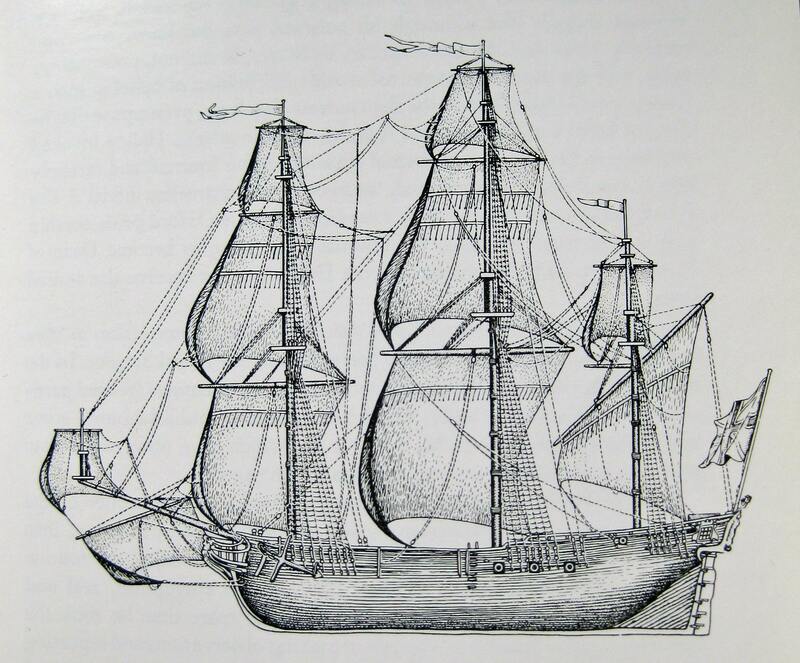 Business started booming and in 1700 Liverpool’s first slave ship sailed off. 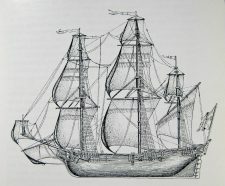 This slave ship was called the Liverpool Merchant. It transported 220 slaves to Barbados. 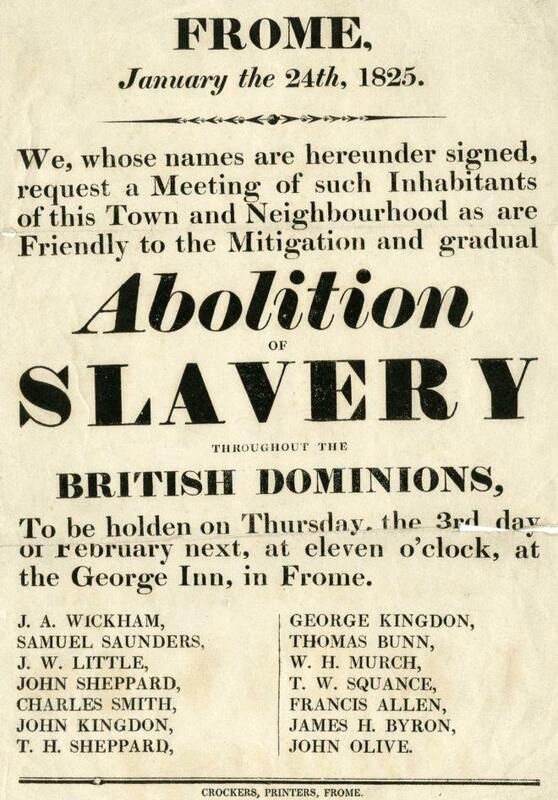 These slaves were all together sold for £4,239 (pounds sterling). That’s less than £20 per slave. Liverpool had 8 major slave traders who together could transport 25,820. That worked out at around 50-550 slaves per ship. The price of a slave followed the law of offer and demand. The slave dealers made so much money that soon Africans came to be known as “black gold”. Slaves were sold in the Americans for about 150 dollars a head! Later when the slave-trade was declared illegal Africans brought much higher price. 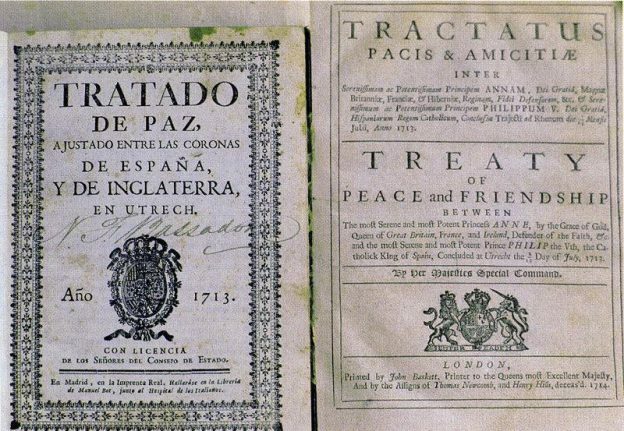 In 1733 England signed a treaty with Spain called the ‘Treaty of Utrecht‘. England promised at least 144,000 slaves at the rate of 4,800 slaves per year. 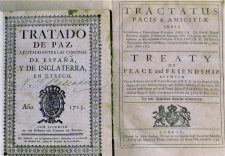 For the agreements in that slave trade treaty, the British now still hold on to Gibraltar. illegal to remove any person forcibly from England. The slave trade still continued due to the fact that so many of the major political players in Liverpool and such were heavily involved with slavery. Only in the beginning of 1800 the conditions of slavery transportation were improved. Then the mortality of slaves was very low and from the 25% in 1700 it dropped to 15% after the 1730’s and only to 5% or 10% in early 1900. Liverpool as a business base for slave trading. One prime example was Richard Pennant who was Liverpool’s MP. He owned 8,000 acres of sugar plantations and over 600 slaves in Jamaica. He was in office between 1777 and 1780 then re-elected in 1784 to 1790. Liverpool was the slavetrade capital in the British Empire. Three out of 41 councillors in Liverpool were slave ship owners or major investors in the slave trade. 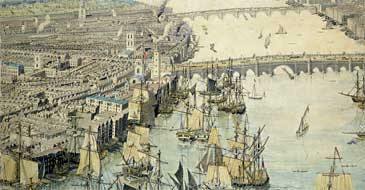 During the course of the period 1700 to 1807, Liverpool was responsible for half the British trade in slaves. During the years of 1787 and 1807, all 20 mayors who held office in Liverpool financed or owned slave ships. Abolishment of slavery in the western world. 1807 Slave trade was abolished with law in the Caribbean. Trans-Atlantic slave trade was abolished. 1808 was also the end of slave trading in U.S.A. It wasn’t until 1827 however that Britain declares the slave trade as piracy making it punishable by death. In 1833 slavery was abolished throughout Europe and the Emancipation Act went through British parliament. 1838. It still took another 11 years until 1838 before slavery was fully abolished within the British Empire. 1850 was the end for slavery in Brazil. Sadly, the unequal system continued. The first absurdity was a compensation of some £20,000,000 (20 million pounds) to the planters. Nothing was awarded to the former slaves. Future for the now free slaves and new labour forces for plantations. They were forced to continue working in arduous conditions on the plantations. A system was invented introducing high taxes on smallholdings and high rates for licenses. The plantation owners tried to shackle the labourers to the large plantations. Arrival of labourers from India worsened conditions for the ex-slaves. In 1844 the shortage of labour led to the introduction of indentured labour from another of Britain’s colonies, India. The Indian labourers made conditions worse for former slaves as they undermined any attempts to achieve improve conditions through strikes. Workers from India moved to the Caribbean. By 1917 145,000 Indians had been transported to Trinidad and 238,000 to Guyana. Jamaica was also affected with around 39,000 immigrants. The only island not affected was Barbados. ‘Slavery is at the heart of the wealth of London’ (1993). Let’s not forget that fact. Epilogue – these are the neverending results of slavetrade. 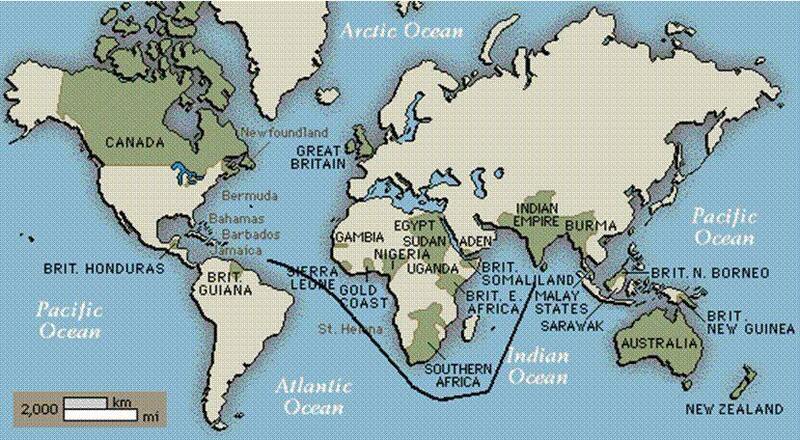 Millions of people in the Caribbean, America and other countries will never know the history of their descents. With the robbery of their ancestors from Africa, their past and the history together with their their racial origin were lost. These are the descendants of slaves, people who lived terrors during the commerce in human cattle. element that can connect them with a race or nation of origin. The only successful try, but not 100% reliable for some people, was from the author of the book “Roots” Alex Haley. In his case the origins were likely to be “Mandinka” from Gambia. of connection with the past is a dream. The traders didn’t mention the slaves nationality or their names. Slaves got their names from people who bought them, and hence the genealogical research is not possible. Geraint Smith said – ‘Slavery is at the heart of the wealth of London’ (1993). Let’s not forget that fact. 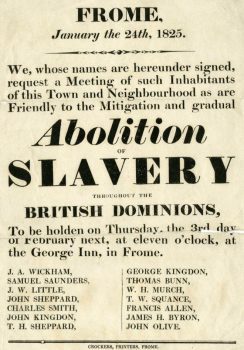 Sources: http://www.britishempire.co.uk/ http://212.212.12.5/arm/CronOfColonialism.html http://www.qub.ac.uk/english/imperial/carib/slavery.htm http://www.flamemag.dircon.co.uk/slavery_in_london.html https://www.uni-due.de/SVE/VARS_Caribbean.htm Epilogue – these are the neverending results of slavetrade. Next: Grand Bay Fossil site, archeology on Carriacou.